Q: When did you start blogging and when did you decide to open your shop? A: First came the shop, then came the blog. I began making hair accessories and as that endeavor began to grow, I decided to start a blog to promote my work, connect with other artists and have an outlet for all my loves like flowers, food, fashion, etc. Q: What inspires your creations? A: I'm a romantic for sure - hence the desire to create flowers adorned with vintage jewelry! I am a sucker for old things and find inspiration as I dig in boutiques and estate sales for time worn elements like vintage scarves, old postcards and jewelry. A: I feel like my personal style is always evolving. I spent two years working at Anthropologie which influenced my fashion sensibilities incredibly - as you can imagine! I love to wear neutrals with pops of gold like a chunky bracelet or earrings. I enjoy mixing things up with thrift store and vintage finds. I have two vintage dresses in my closet now, just waiting to be altered. I'm a sucker for boots too! My biggest score was finding a pair of caramel colored Frye boots at a thrift store for $5!! Q: If you could see one of your accessories on any 2 celebrities, who would you pick? A: Ooo. I would love to see Natalie Portman wearing one of my pieces. She is so elegant and down right gorgeous - especially when she had that darling pixie hair cut. Penelope Cruz is another woman I would love to make a piece for. I would have her wear her hair in a low, sweeping side bun with lots of wisps and I'd make her a big, lush flower clip maybe with some jewel tones in it! Swoon. Visit Emily's shop & come back to let me know what your most favorite design is. I love the Gray Flower with Pearl Cluster Headband. I follow W&P via GFC. I follow F&F via GFC. I fave F&F on Etsy (houseofplush). I'm a W&P FB fan (Suzanne Gregg). I'm a F&F FB fan (Suzanne Gregg). I follow @blairita on Twitter @kiddo47. I follow @fernandflora on Twitter @kiddo47. I entered the Handmade Collectibles giveaway. I love gray flower with pearl cluster headband! 1.So hard to pick a favorite. love the 3 white rose headband. 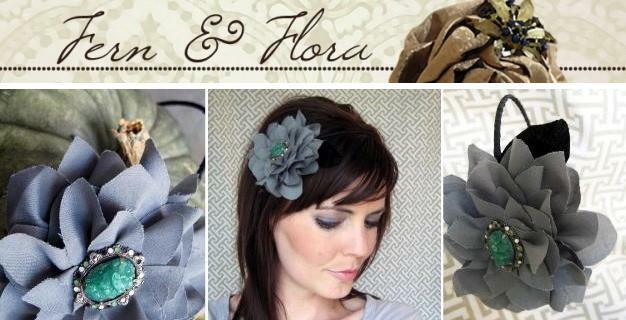 i love the Gray Petal and Cameo Headband! i'm thinking i may have to save up a little pocket money for this one! I really like the Gray Petal and Cameo Headband. I entered the Sandy A La Mode giveaway. ooolala I love the Gray Petal and Cameo Headband!! The gray flower with pearl cluster headband is SO pretty! I love it! Hi again! I know I am being selfish but I love this headband! So I must enter! 1. I follow Wild & Precious! 3. I am a fan of Wild & Precious on Facebook! duh! 4. I am a fan of Fern & Flora on Facebook now! 6. I am following you on Twitter! 7. I am following Fern & Flora on Twitter! 11. OOOPS! I forgot the main entry! My favorite Fern & Fora design is the Coral Dahlia Headband! Great colors!!! I tweeted about the giveaway (@shelltonbelle)! Yay! I like the gray flower w/ pearl cluster the best. and entered another giveaway- 2 actually! LOVE the Gray Petal and Cameo Headband! I really like Three White Roses Headband! My fave! I've entered several giveaways (you've got some wonderful and generous sponsors!) and I'm about go to enter Hello, Splendor's giveaway! Fern & Flora is a favorite on etsy! I'm a W&P fan on facebook! I'm a Fern & Flora fan on facebook! I follow @blairita on twitter (@shelltonbelle)! I follow @fernandflora on twitter (@shelltonbelle)! I've entered all of the other celebration giveaways so far! i like the pearly may headband! blog follower of wild and precious as khrista porcadilla. blog follower of fern and flora as khrista porcadilla. added fern and flora as faves on etsy as bellekhris. following blairita on twitter as bellekhris. following fernandflora on twitter as bellekhris. I like the Ivory Bow Headband!! Fern & Flora is now a favorite on etsy! I love the three white roses design! I favorited Fern & Flora on etsy! I like Wild & Precious, and Fern & Flora on facebook! I follow Wild & Precious on twitter! I follow Fern & Flora on twitter as well! I entered into the vintage mosaics giveaway! i love the ivory bow headband! i lvoe the spice flower headband, gorgeous colors! I also added your celebration giveaways to my blog! Favorited Fern & flora on etsy! following Fern and Flora. I really like her blog btw. Like Fern and Flora on FB. following Fern and Flora on twitter as well. Gray flower with pearl cluster is honestly the cutest! I love it! I love the gray flower with pearl cluster headband! So whimsical! have entered a few other giveaways of yours. I participated in the other celebration giveaways! My favorite is the Blue and Gold Vintage Floral Headband. I love the Spice flower headband. follow Wild & Precious via GFC! My favourite is the Ivory and Pearl Dahlia Headband. Taupe and Black Blossom Headband! I follow W&P on GFC. I entered the Sandy ala mode giveaway! I love the grey rosette and pearl headband-I also love her hair in the pictures!